If maritime companies want to survive in the digital economy, they must build digital service solutions on top of their products, says DTU professor Tim McAloone. But they are up against a conservative maritime business where new services are often met with scepticism, according to Danish Shipping's digitisation manager. About 10 years ago, the management of VIKING Life-Saving Equipment made a crucial decision. 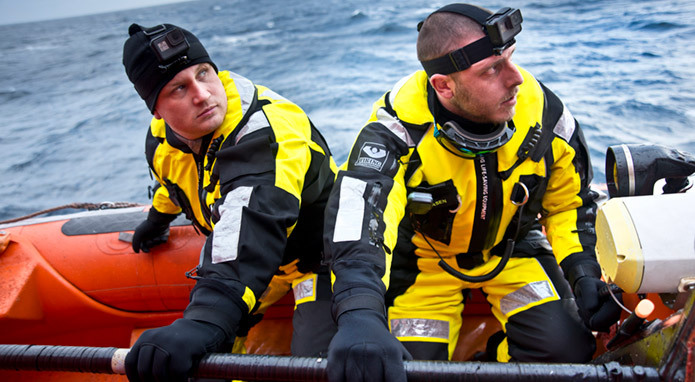 Rather than primarily selling life-saving equipment, the world-leading Danish producer of maritime life-saving equipment created a business plan based on offering fixed service agreements for the equipment already sold. "Back then, things were very traditional. Customers had some parts replaced and paid for them plus an hourly rate for the service station. However, it made management realise there was a market for selling service based on agreements and at a fixed price. And that became the concept behind Shipowner Agreements," explains Henrik Balslev, IT Director at VIKING. 'Shipowner Agreements' mean that the company services and maintains their customers' life-saving equipment for a fixed price. The special aspect about maritime life-saving equipment is the mandatory inspection once a year. While shipowners previously owned life rafts, more than half of the customers now lease the equipment and leave all the service and controls to VIKING, explains Henrik Balslev. "The concept has been a great success, and has helped change our business model. It's no secret that we now earn more on servicing than selling products," he says. This transformation, which is the precise reason that VIKING today sells 'security on vessels', is something that many production companies can learn from. This is the opinion of Tim McAloone, professor at the Department of Mechanical Engineering at the Technical University of Denmark (DTU) and expert in product/service systems, also called servitisation. "If a company focuses exclusively on producing a physical product that everyone in principle can copy, it won't last long," says Tim McAloone. In essence, servitisation involves a company adding new services to its physical products in order to offer a more complete solution while bringing customers closer. As new digital technologies spread and just about all equipment, machines and systems today are linked via chips, sensors and other technology, the model has wind in its sails. In the digital economy, the companies' own big data is a cornerstone, and the more and better data, the company has about its customers, and the better the data is coordinated, the more value-adding service solutions the company can deliver on top of its physical products. “It is about finding out where you can differentiate and stand out from competitors in relation to understanding and interpreting needs based on the customer’s behavior and activities, and then developing solutions based on this. Companies must ask themselves how their exact product can open doors to selling more services. Digitisation and use of data is a crucial means to success here,” says Tim McAloone. In its planning system, VIKING has all the data on the customers' life-saving equipment, where it is located, and when it was last inspected. This means that VIKING can easily take care of all administration and notifications of upcoming service inspections on behalf of their customers. Digitisation also provides good opportunities for Danish companies, which typically cannot compete on price, to still compete for market share. Optimisation can occur both at the bottom of the business in the form of technology that can improve the efficiency and automate the operation of systems and equipment, and it can happen at the top of the business, as is the case with VIKING. VIKING's development has evolved in stages and been constantly steered by the vision of selling 'safety on vessels'. According to Henrik Balslev, the overall IT investment, which also includes a new financial system, will run into 'the low tens of millions of Danish kroner'. In its planning system, VIKING has all the data on the customers' life-saving equipment, where it is located, and when it was last inspected. This means that VIKING can easily take care of all administration and notifications of upcoming service inspections on behalf of their customers. "This saves shipowners a lot of trouble, and the captains can simply sail to the nearest one of our almost 300 service stations worldwide when it's time for a service," says Henrik Balslev. VIKING Life-Saving Equipment made a crucial decision approximately ten years ago. Rather than primarily selling life-saving equipment, the company devised a business plan based on offering fixed service agreements for the life-saving equipment already sold. That has been a great success, explains Henrik Balslev, IT Director at VIKING. "It's no secret that we now earn more on servicing than selling products," he says. In January last year, the Liberal-Conservative government in Denmark presented its growth plan for the Danish maritime sector, where part of the vision is that by 2025, the Danish maritime sector will be 'a powerhouse for digitisation'. For that to happen, shipowners must see the value of the new service solutions, but that is not always the case, even though the shipowners vary a great deal, explains Asbjørn Overgaard Christiansen, Head of Innovation and Digitalisation at Danish Shipping. "Maersk, for instance, is unique simply due to its size. They do a lot in terms of development - also at the top of their business. And they do more and more with partners. Others also have a strong digital strategy. Many small shipowners work with digitisation and development, but this typically concerns fuel efficiency, which is reflected directly on the bottom line." he says. Although the Head of Digitisation believes it is important that shipowners 'throw themselves into the digitisation battle', because the development is moving fast, he also encounters widespread scepticism in the business when it, for instance, comes to servitisation. "When speaking to people in the shipping companies, the attitude I meet is very much that 'new smart business models are not really for us'. So entering into agreements, which entail a high level of operating costs, are met with resistance. The competition is tough, the margins small, and therefore it is all about ensuring low operational costs," says Asbjørn Overgaard Christiansen. One of the companies, which continuously invests in optimising operating process efficiency at the bottom of the business, is Maersk Drilling. Here too, digitisation brings a wide range of benefits linked to a smarter and more cost-efficient management of equipment and systems on the 23 drilling rigs in the North Sea, like those run by Maersk Drilling. Thousands of RFID chips are currently being replaced with a new generation based on open standards. "We have discovered some very good uses, and we are now expanding our portfolios to find where else we can use the new chips to our advantage," explains Kristian Mortensen, mechanical engineer and project manager at Maersk Drilling's department for Maintenance, Processes & Solutions, who is leading the comprehensive replacement of the many chips. The benefit of having RFID chips in all the hydraulic hoses, drill pipes, electrical installations etc. is you by scanning bar codes easily can identify every single piece of equipment. All the RFID barcode has to do is link the equipment out in the North Sea with Maersk Drilling's ERP system in Lyngby. "All the data of interest in relation to maintenance are fed into our ERP system, and then we can adapt our maintenance requirements in relation to the counters that are now relevant for this piece of equipment or maintenance work," says Kristian Mortensen. Maersk Drilling is currently replacing thousands of RFID chips. 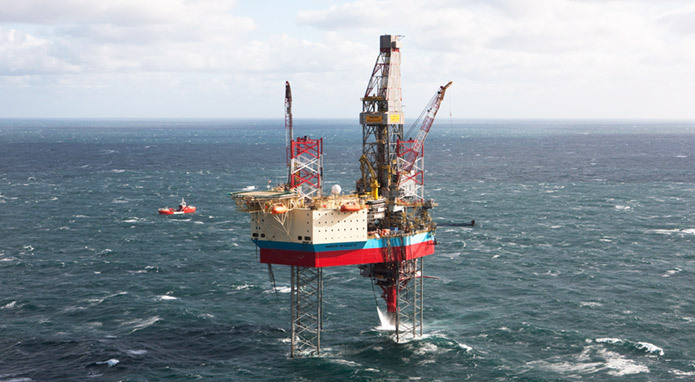 This brings a wide range of benefits in relation to smarter, secure and more cost-efficient management of equipment and systems on the 23 drilling rigs in the North Sea, like those run by Maersk Drilling. The benefit of having RFID chips in all the hydraulic hoses, drill pipes, electrical installations etc. is that you by scanning bar codes easily can identify every single piece of equipment. As well as making work easier for the technicians out on the rigs, who instead of filling in physical papers, now can type data directly into an ERP system via a tablet, the chips also make the technicians' everyday lives safer. According to Kristian Mortensen, it is hard to put a price on the value that the new RFID chips create. "But it means we are delivering a better, more efficient and stable product. In principle, this isn't something that will end. We are still finding new uses for the chips," he says. And that is precisely one of the points of digitisation, Professor Tim McAloone points out: it will never stop. New opportunities are always opening up for collecting and combining data to deliver even better service solutions. "Many companies will be forced to make some brave decisions if they want to remain relevant. And if they don't, a competitor is likely to offer digital service solutions in the same area at some point in the future," says Tim McAloone. At VIKING, IT Director Henrik Balslev describes the company's transformation as a journey where the end destination has not been reached yet. Along the way, for example, VIKING expanded its portfolio through acquisition, and today it can also offer equipment for fire fighting and lifeboats with hard hulls, naturally including service agreements. The vision also entails viewing yourself as a future one-stop-shop for everything associated with safety on vessels. "We have now come so far that our service turnover has overtaken our product sales. We have also grown and conquered market share so that today we are clearly number two in the world market," says Henrik Balslev, who expects the next stop on the journey to be the introduction of robotics and chatbots to further automate service.